I received an even more mysterious device that does input (and output?) via audio cables… still have to summon the courage to give it a test run! Plug-outs: added a new interface to turn on or send output to different hardware devices. Audio is still the default and included with Lucid Scribe. 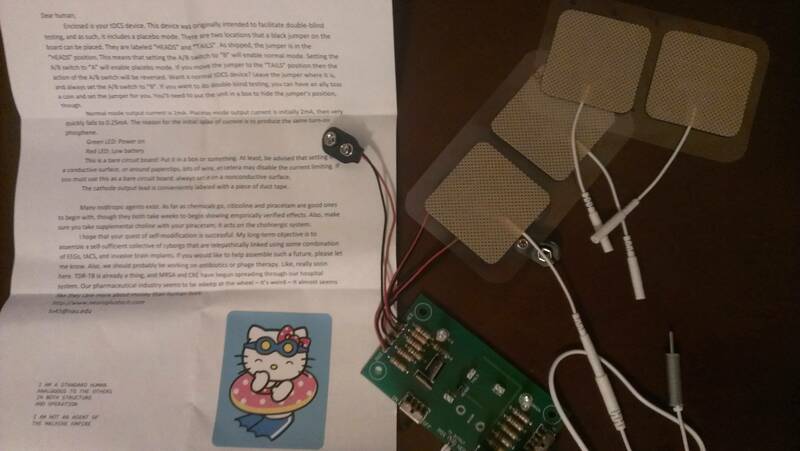 I received a free tDCS device from a generous benefactor along with a mysterious letter calling for the assembly of a self-sufficient collective of cyborgs that are linked using EEG, tACS, and invasive brain implants. Merged Jef’s tweaks and added configuration options to trigger tACS devices connected via an Arduino board. The first drop down list determines the COM port the board is connected, the second drop down list sets the delay, in minutes. The first text box is the message it will send when eye movements are detected, and the second text box holds the message it will send after the delay has passed. Added the NewLine value to the end of the messages to the Arduino board. Sending the messages to the Arduino board as integers instead of strings. Added configuration options to trigger tACS devices connected via an Arduino board. The first drop down list determines the COM port the board is connected, the second drop down list sets the delay, in minutes. The first text box is the message it will send when eye movements are detected, and the second text box holds the message it will send after the delay has passed. Let us pray that Jef doesn’t electrocute himself in his search for lucidity! 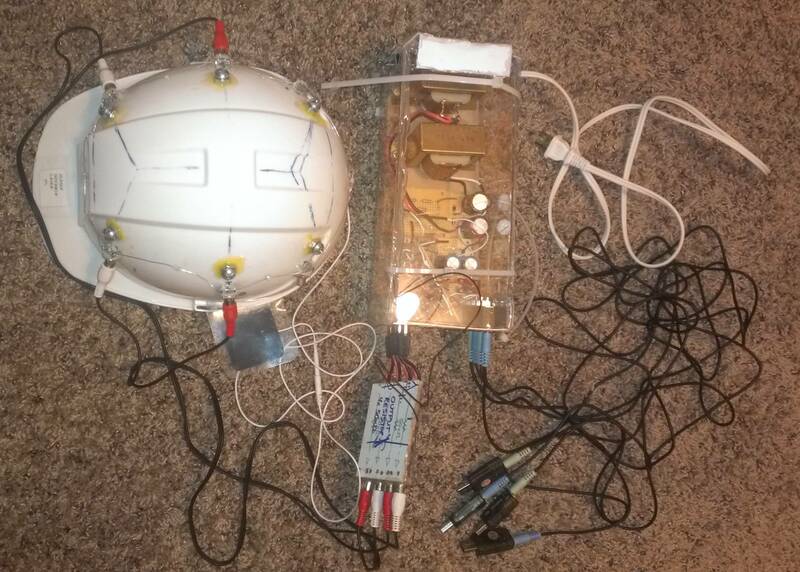 Added configuration options to auto trigger a USB relay to turn on a tACS (Transcranial Alternating Current Stimulation) device when eye movements are detected. Works with the Yocto-LatchedRelay for now, will add more relays or tACS devices by request. The text box lets you select the target device, “ANY” should work if you only have one. The first drop down list is the state it will change the relay to during REM, and the second drop down list is the state it will change the relay to when REM ends. Also added a new channel, NZT-48, that will play a video when the Beta channel is above the threshold and pause it when it is below. The algorithm needs to be set to Beta for this to work and the text box needs to point to a video file on your computer. This one works for me: Burn E, and it helps the kids pay attention.